Inspired by my blogging buddy Tor Constantino’s own conversation with Cleverbot, I thought I would try my (virtual) hand at one. What follows is the (virtually) unedited transcript (I made typos, ok? I fixed them). Enjoy! User: Cleverbot, how stupid are you? Cleverbot: I am not stupid. User: How many brains do you have? User: Do you eat them like zombies? Cleverbot: The color green? No, I don’t eat it. What’s your birthday? User: Who said anything about the color green? Are you perhaps referring to the pallor of zombie skin? User: You do? But are you sure? Do you watch the Walking Dead on TV? User: Hmm. I think you’re lying. Are you lying, cleverbot? A real cleverbot wouldn’t lie. User: Why, yes–yes, I do. I’m a sentient member of the species homo sapiens sapiens. What genus are you, genius? User: That you are an idiot. User: I thought so. But you are full of hot air, am I right? Use: Full of hot air, dummy! Cleverbot: No it’s an airline. User: What is? What’s an airline? Are you? I don’t think I’ll ever fly again. Cleverbot: You misunderstood, does the girl Lois Schulz have feelings for me? User: I misunderstood? I don’t think so, uncleverbot. I don’t even know who Lois Schultz is. Do you? User: Why thank you. They call me ‘RandomlyChad.’ But, truly, I’m just trying to keep up with your egregious, random non-sequiturs. Cleverbot: I guess you have a point there. Cleverbot: Yes. I’m capable of thought. User: I am seated, numbskull. Cleverbot: I want you to be Cleverbot. User: And I want you to actually possess the merest smidgen of intelligence, but the Rolling Stones said ‘You Can’t Always Get What You Want.’ Is that true? Cleverbot: Actually, no. I’ve never had anyone threaten to close a tab to stop talking to me. User: Well, allow me to be the first, you big, dumb server farm. 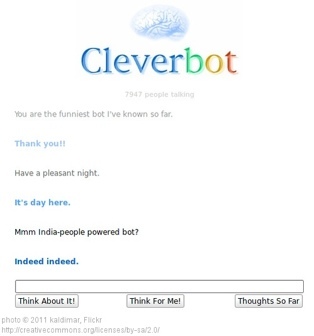 Have you ever “conversed” with Cleverbot? Share it the comments!